Mohamed Gnunu GNA Libyan Army spokesperson at yesterday’s press conference (Photo: PC/GNA). Tripoli residents reported a night of intense fighting, or at least the sounds of firing, overnight after a day of consolidation by both the pro Faiez Serraj and Khalifa Hafter forces. The sounds were reported to be coming from around 20 km outside the centre of Tripoli beyond the Tripoli International Airport, Ain Zara and Wadi Rabea areas. The official and unofficial war media machine on both sides has been working hard to portray progress, if not success, with ample photographic and video footage showing areas allegedly under control and armour and personnel being moved to the frontlines. At a press conference yesterday, Faiez Serraj’s official Libyan Army spokesperson, Colonel Mohamed Gnunu, said that the GNA-aligned ‘‘forces are moving steadily to defeat the aggressors and force them to retreat from Tripoli’’, and that they “continued the victories to achieve the goal of the process of responding to the aggressors and cleansing all Libyan cities from the outlaws under the leadership of Khalifa Haftar, and to confront the attacking forces in the city of Tripoli and force them to retreat’’. 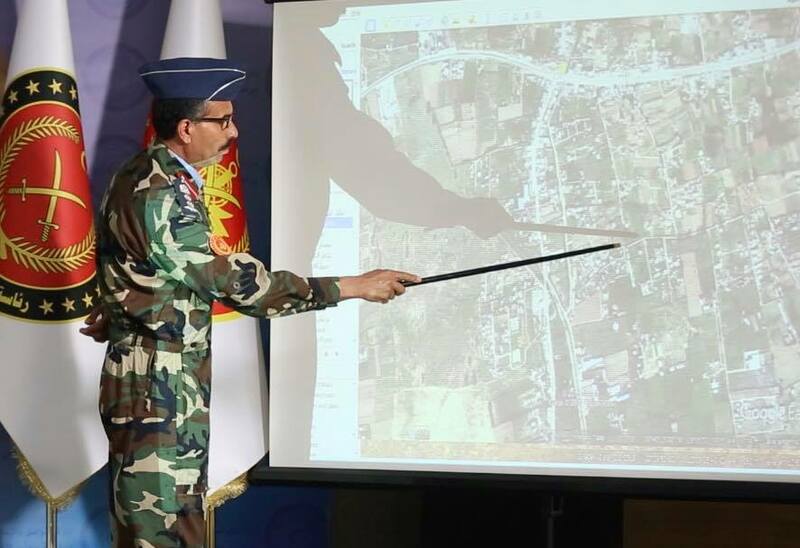 Speaking from the Prime Minister’s Media Centre and with the help of a map, Gnunu claimed the GNA-aligned forces had taken ‘‘control’’ of the Wadi Rabea area, the km 27 bridge west of Tripoli, the Soug Al-Ahad bridge and the Tripoli International Airport areas. He added that GNA-aligned forces had monitored the movements of the ‘‘aggressor forces’’ in the Soug Al-Khamis, Al-Aziziya buildings, the Bir Al-Alem, and the Bir al-Touta Triangle. Gnunu claimed the destruction of a number of vehicles and armoured vehicles, the arrest of a large number of forces and the surrender of others many of whom were of a young age. He pointed out that the clashes continued between the two sides in a cat-and-mouse mode, meaning that some areas are caught in the crossfire while still vulnerable to civilian population movements. Gnunu said that the role of the GNA-aligned Air Force was ‘‘effective, as it carried out a huge number of sorties, through which the enemy’s supply sites and supply lines were uncovered’’. These were ‘‘dealt with and bombed’’. The GNA-aligned Air Force also monitored and dealt with moving targets. They also targeted ‘‘the bases used by the aggressor forces in the hostile raids that targeted civilians at Mitiga civilian airport’’. He added that work is continuing in the (war) field between the fighting axes in an organized and balanced manner to defeat the aggressors and to maintain the liberated sites and secure the Tripoli cordon. He stressed the solidarity and continued effort, by the information and reconnaissance forces in providing intelligence and monitoring the sites and movement of the aggressor forces. This is both within and outside the area of operations. This is in terms of supply lines from the area from the south of Sirte to Jufra, as well as the Shwerif and Gharian, and the use of some bases and airstrips used by the aggressor to carry out its sorties. Gnunu added that the Libyan Army forces of the ‘‘legitimate (Serraj) government’’ in all its disciplines and the forces supporting it, are still at the utmost seriousness in effort, valor in combat, precision, professionalism and greatness in the spirit of patriotism and the right to defend the homeland”. On the other hand, he reported on the ‘‘indiscriminate use of weapons by hostile forces at residential sites and the shelling of the Mitiga Civil Airport, which provides transportation to all citizens between the east, west and south, inside and outside the country, as well as the use of some dwellings, sites and airports in the storage and transport of supplies, and as operating rooms”. Gnunu said that the GNA-aligned forces had ‘‘complete and detailed information and will take all its sanctions to and we will not be merciful against those who encroached on Libya, Libyans, and went outside of the legitimacy of the state’’. The Khalifa Hafter-led Libyan National Army and aligned forces, on the other hand, reported through their Military Information Division that its forces were also ‘‘progressing in a fixed plan towards the centre of Tripoli’’ whilst being ‘‘professional’’ and ‘‘protecting civilians’’. They claimed to be in ‘‘control’’ of Tripoli International Airport, Twesha, Swani ‘‘most of’’ Ain Zara, the 4th Brigade Camp in Azizia and Ruwemi prison. What is clear is that the situation on the ground remains fluid as the opposing forces engage each other in a cat-and-mouse manner, with locations changing hands during the day. However, whilst some of the exact details may be very difficult to establish at any one fixed moment during the fog of war, it is very clear from speaking to residents in Tripoli that the Hafter forces have been deterred from penetrating into the centre of Tripoli beyond a 20 km, plus-or-minus, cordon on the capital’s outskirts. Meanwhile, on the humanitarian front, the United Nations Office for the Coordination of Humanitarian Affairs in Libya (OCHA) reported the ‘‘further escalation of violence in and around Tripoli led to an upsurge in displacement, with 1,675 new displacements reported over the last 24 hours. This brings the current total of IDPs to 4,500, and numbers are expected increase further, should violence prevail. Humanitarian partners are extremely concerned with regards to the disproportionate and indiscriminate use of explosive weapons in highly inhabited areas and urban settings, and call on parties to the conflict to protect civilian infrastructure, such as schools, medical facilities and power stations. by parties to the conflict.